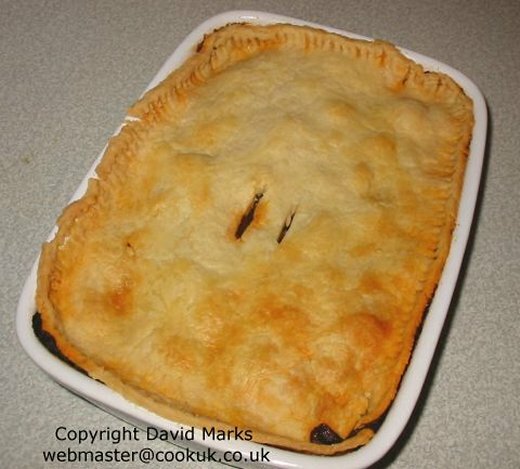 Steak and Mushroom Pie Recipe, step by step pictures. Steak and mushroom pie with shortcrust pastry is a truly British dish and one we should be proud of. Good beef, wholesome vegetables and a gravy full of body make this a meal to remember. It's not particularly difficult to cook either. Just follow our step by step instructions and pictures and you will have a meal all the family will enjoy. The preparation time is around 35 minutes (mainly chopping and removing the excess fat from the braising steak). However, after cooking the filling, it must be left to cool for at least 1½ hours, preferably 3 to 4 hours. The reason for cooling the filling is that the shortcrust pastry cooks far better on top of the pie if the filling is cool. 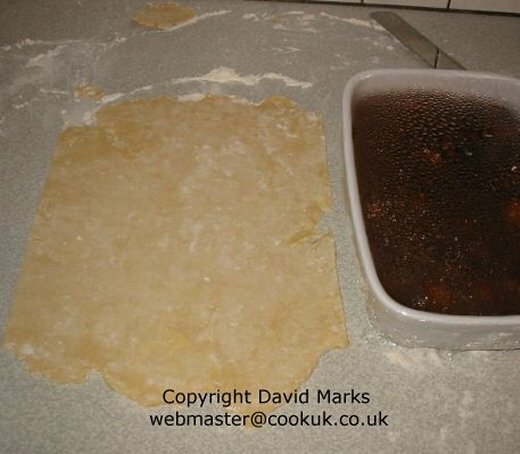 Instead of making the shortcrust pastry yourself, you can buy ready rolled shortcrust pastry from your supermarket or shop. You need enough to cover the top of the pie dish. 1 large frying pan with a lid or a medium frying pan and a casserole dish with a lid. 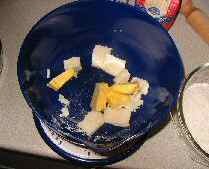 Ingredients for the filling (click to enlarge). Melt the lard in the large frying pan. 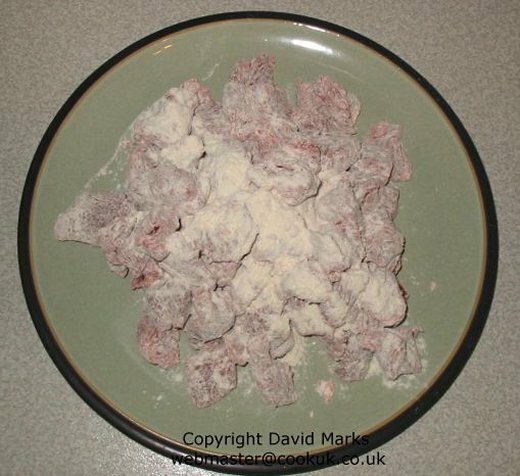 Whilst it is melting pour the flour over the chopped braising steak and mix together with your hands. Make sure all the steak is covered by the flour. The flour on the meat will give a thick gravy later on. When all the lard is melted, put the flour covered steak in the frying pan and fry until the meat is well-browned (about 7 minutes). If your frying pan is not large enough, you can brown the meat in two separate batches. 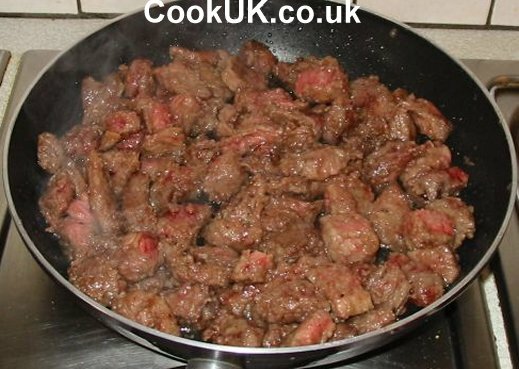 Click the picture to see the browned meat more clearly. Use a slatted ladle to remove the meat from the frying pan, leaving any fat in the pan. Turn the heat down low. 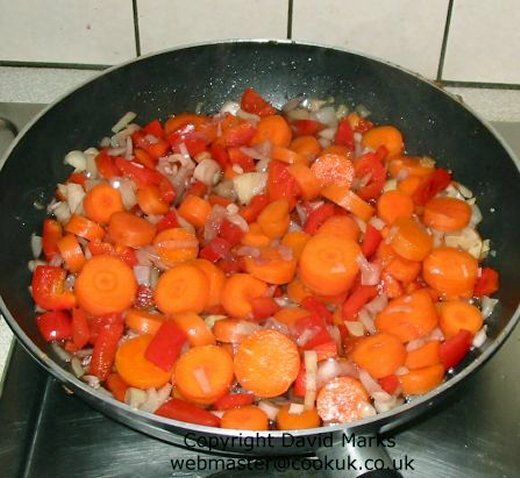 Add the carrots, peppers, onions and garlic to the frying pan. Cook on a low heat for about five minutes turning the vegetables frequently to ensure they are all lightly coated in some fat. A little extra fat may be required at this stage. Return the steak to the frying pan with the vegetables. Add the stock, tomato purée and Worcestershire sauce (Lee and Perrins). Sprinkle with salt and pepper to taste and bring the mixture to a boil. Turn down to a low setting, cover with a pan lid and simmer for two and a half hours until the steak is tender. The frying pan must be covered whilst cooking to preserve the moisture and prevent the meat drying out on the top. If you don't have a large enough covered frying pan, the filling can be cooked in a covered casserole dish in the oven at 170°C / 325°F / Gas Mark 3. Stir the mixture at least twice whilst cooking to stop it sticking to the bottom of the pan / casserole dish. 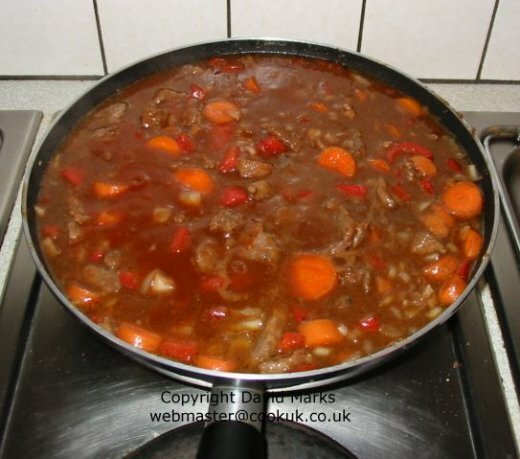 When cooked, transfer the mixture to the final casserole dish (if not cooked in a casserole dish) and leave to cool for at least 1½ hours, preferably 3 to 4 hours. 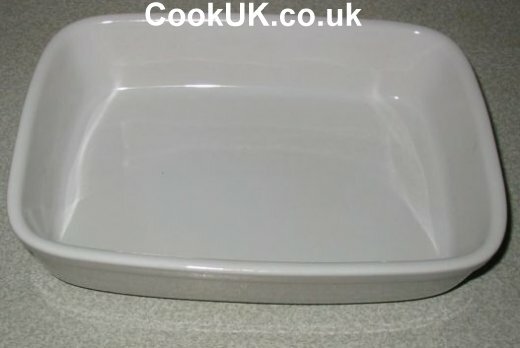 The casserole dish we used measured 25cm x 16cm by 5 cm high (9.5 in x 6.5in by 2in high). 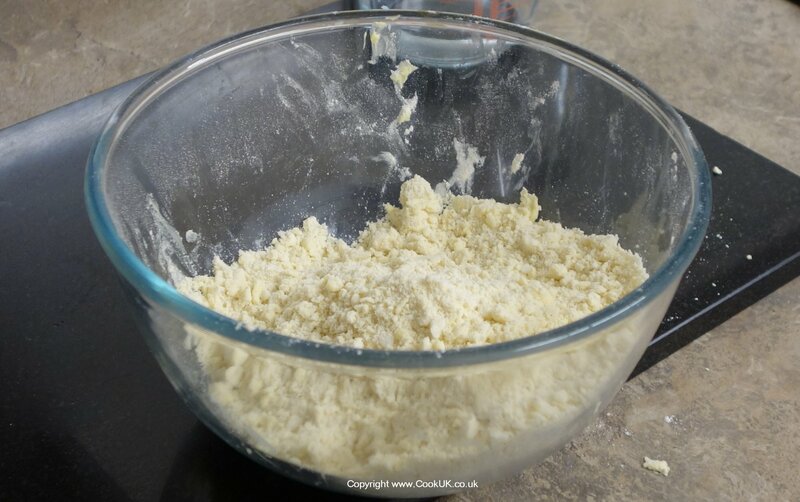 The recipe below has lots of pictures, but you can also view our video on making perfect shortcrust pastry by clicking here. 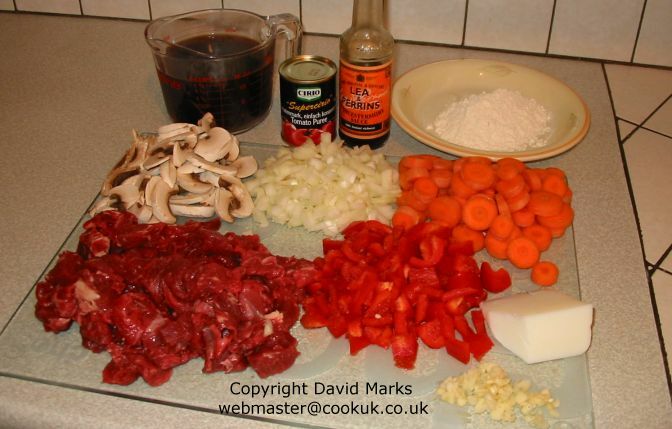 The next step is to make the shortcrust pastry for the top of the steak and mushroom pie. 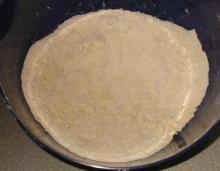 Put the margarine and vegetable fat in a mixing bowl and pour in the flour. The yellow 'bricks' in the picture are margarine, the white bricks are the vegetable fat. Mix it all together with your hands until you have a crumbly texture. Click the picture to enlarge it - all the pictures can be enlarged. This stage should only take a minute or so but it's one of the joys of making shortcrust pastry. 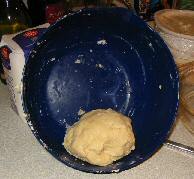 Add 3 tablespoons of water to the pastry and mix it in with a knife. 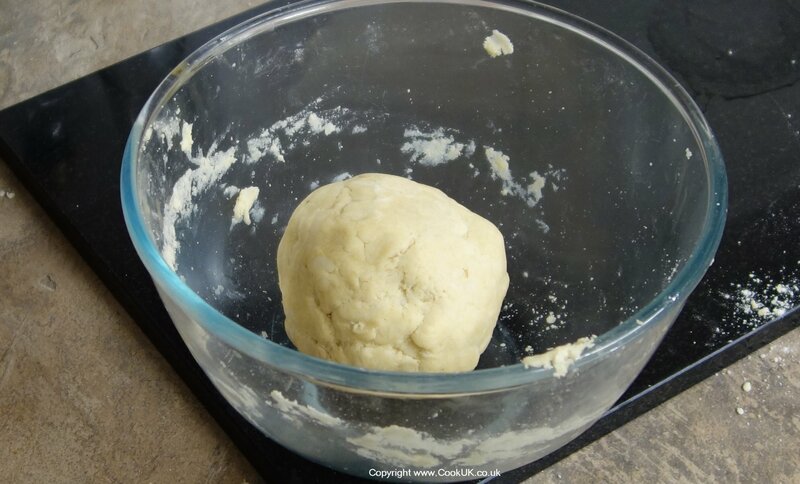 Then use your hands to mould the pastry mix into a ball (see picture). You can tell the mix is correct because the pastry ball will collect all the bits of pastry from the edge of the bowl leaving it almost clean! If it doesn't, add a little more water. Wrap the pastry ball in cling film and put it in the fridge to 'rest' for half an hour. After half an hour, take the pastry from the fridge. 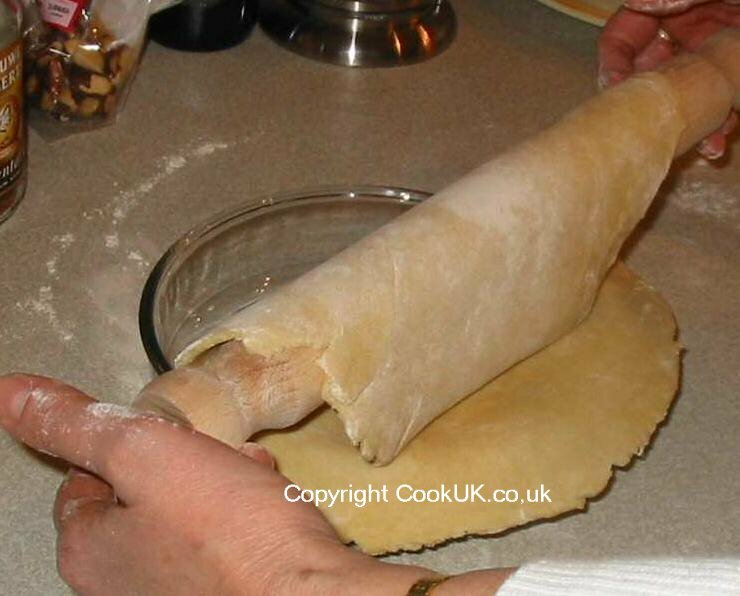 Remove the cling film and flatten the pastry slightly with your hands. 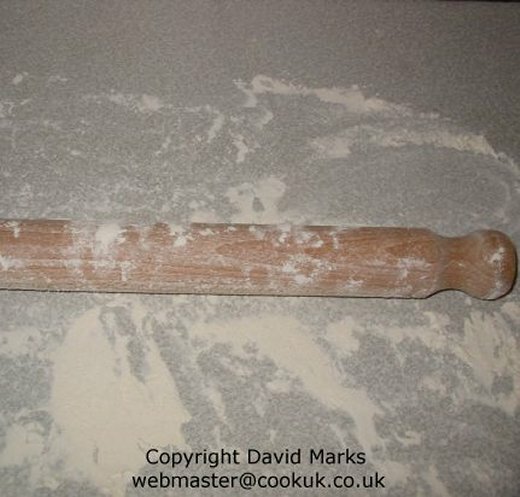 Thoroughly dust the surface with flour and make sure that the rolling pin is coated in flour as well. 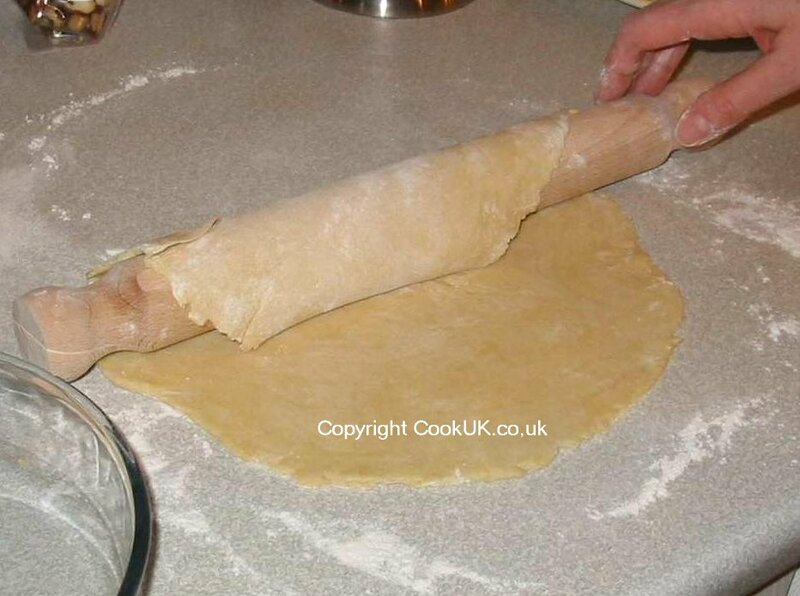 Roll the pastry out with a rolling pin so that it is large enough to cover the pie dish. 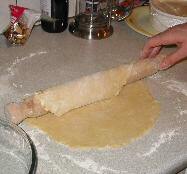 Use several sprinklings of flour on the rolling pin and the surface used for rolling the pastry. Put the dish next to the rolled out pastry to make sure it is about the correct size (see picture on left). Now take the pie filling and pour it into the casserole dish (if not already in there). 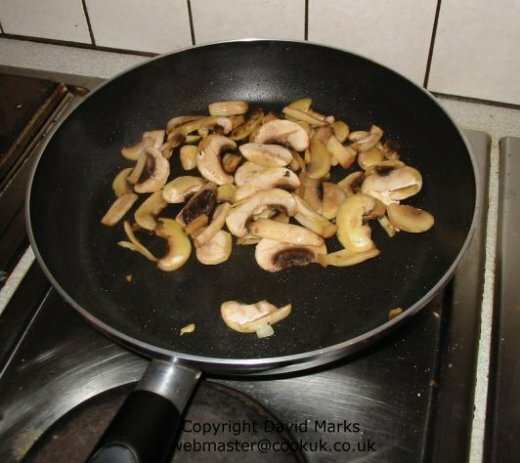 Add two tablespoons of oil to a frying pan and fry the mushrooms at a medium heat for three minutes. Place the cooked mushrooms on the pie filling and mix into it well with a fork or spoon. Turn your oven on now so that it's pre-heated ready to cook later on. Heat settings are 220°C / 425°F / Gas Mark 7. Dampen the top edges of the casserole dish with a little water. This will help the pastry stick to it. See the two pictures on the left for a visual explanation. Both pictures can be enlarged by clicking on them. The idea is to pick up the rolled out pastry and put it in the pie bowl over the top of the steak and mushroom filling (not shown in picture). First, lightly roll 50% or so of the flattened pastry over the rolling pin. Then support the rest of the pastry with your hand and transfer it to the top of the steak and mushroom pie dish. 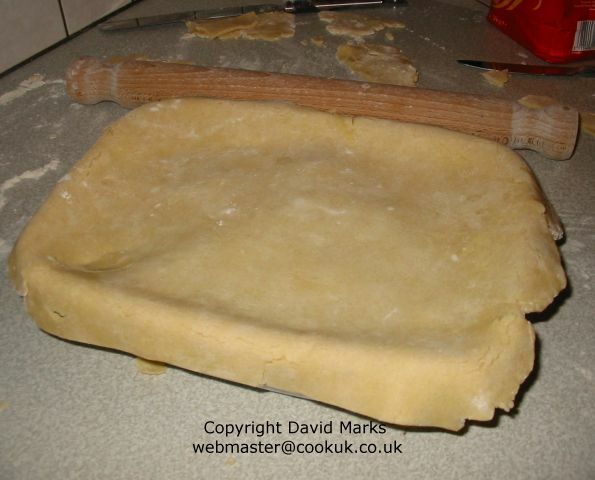 Tuck the pastry down at the edge of the pie and remove the excess pastry using the blunt edge of a knife (see first picture which can be enlarged by clicking on it). Using both hands or a fork, 'crimp' the pastry round the edge of the pie to obtain an attractive finish. Finally make 2 holes with a knife in the top of the pastry to allow the steam to come out during cooking and prevent the pastry top going soggy. Lightly brush the top of the pastry with a little milk to give it a light brown colour when cooked. 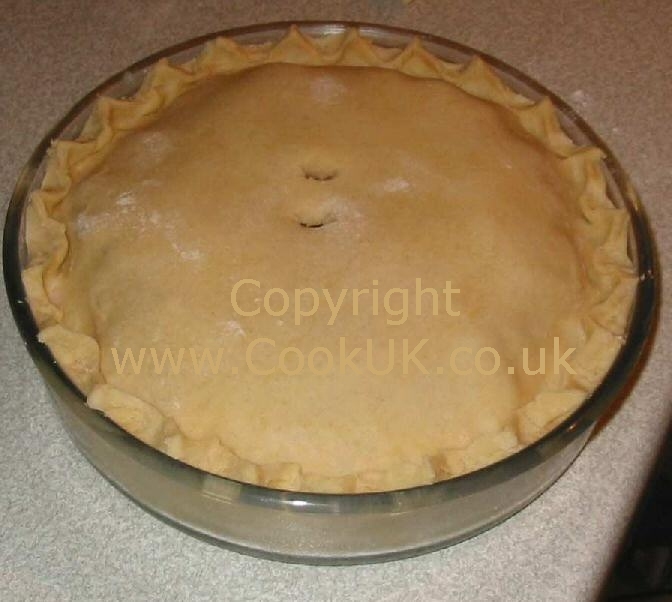 Put the pie in the pre-heated oven (220°C / 425°F / Gas Mark 7) and leave it cooking at that temperature for 10 minutes. Then turn down the heat to 190C / 375F / Gas Mark 5 and cook for a further 30 minutes. Any leftover pie will keep in the fridge for 24 hours and it microwaves well to reheat.